Within your dataset, your opportunities are categorized by the sales-cycle stage they're in. Opportunities start out as prospects, or qualified leads, that have been gathered from various sources. In our scenario, your task is to provide an easy-to-understand snapshot of where these opportunities are in the current fiscal year. To locate the dataset that you uploaded to Analytics, click Datasets on the navigation bar and look for the ProductPipelineUSA dataset. Click the dataset to begin exploring it in a lens. 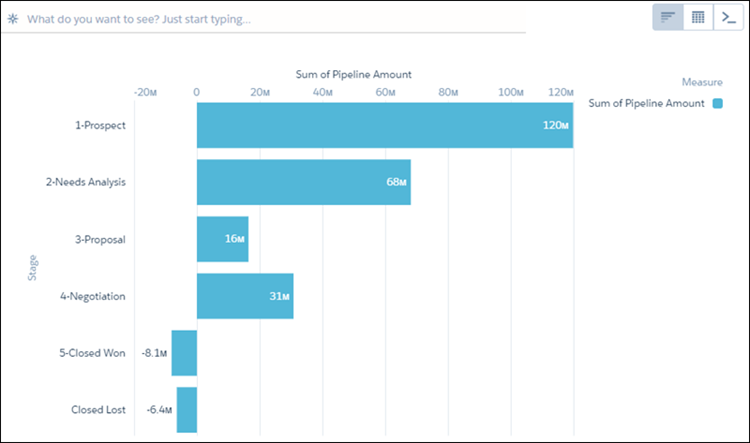 The default exploration brings up a bar chart with a count of rows, but we've already decided that a waterfall chart would be a good visualization for opportunity stages. Before we get to the waterfall, we first have to query the dataset to get exactly the data we want to display, then we'll clip the lens to the dashboard designer. 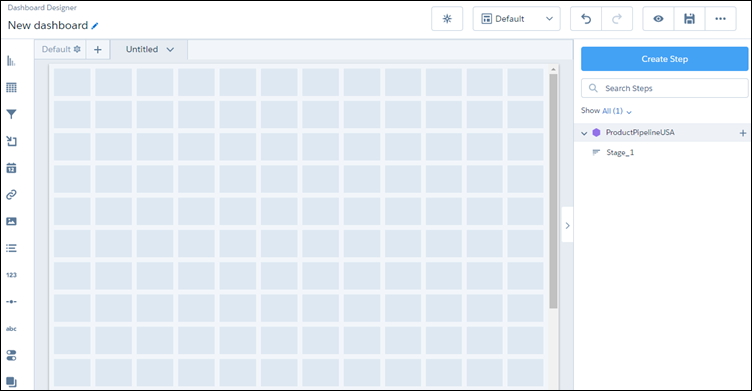 Click the Bars plus button, then choose Stage to group the rows by stage. Click Count of Rows to to change the current measure by setting the Bar Length field. Choose Sum for the aggregate function, then choose Pipeline Amount as the field for the Bar Length. 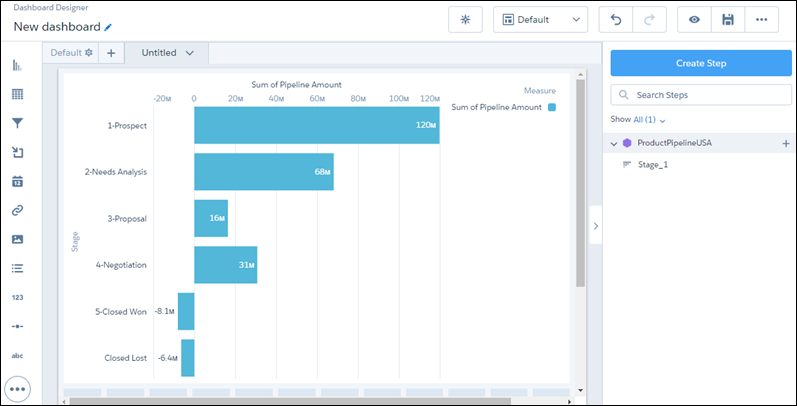 Click to clip the lens (or the exploration with the bar chart) to the dashboard designer. As soon as you clip the lens, the dashboard designer opens with a step in the right-hand panel that represents the lens. The step should have the name Stage_1. Drag the Stage_1 step from the right sidebar onto the canvas to recreate the bar chart. 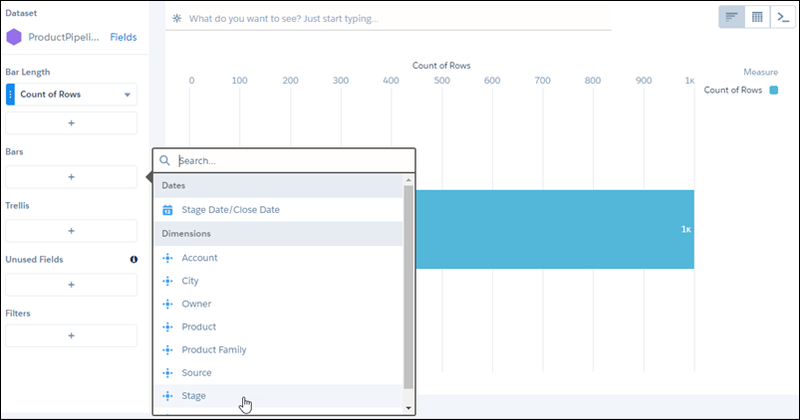 With the bar chart selected, click Chart Type and choose the waterfall chart type. In Title, enter Current Product Pipeline by Stage. Give your dashboard the title of Product Pipeline USA, then click Save. Remember that the original dataset contained all opportunities for this fiscal year, and in our exploration we didn't filter by date. Because of that, this waterfall chart shows where all of the current fiscal year's opportunities are by stage, including those that have closed. What insights can we gain from this waterfall chart? For one thing, it looks like the vast majority of opportunities are still in the early stages of the pipeline. Another insight: The win rate for opportunities that are closed is quite high. Sounds like your company needs to move those opportunities along! What's next? You'll bring your opportunities into focus with a map chart.